The VPN service Windscribe runs a promotion right now that bumps the monthly bandwidth of free users from 10 Gigabytes to 50 Gigabytes. Free account has a traffic limit. Default is 10 Gigabytes per month, but you get 50 Gigabytes instead with the voucher. The Linux client and Android client is only available for paying customers. As far as other features are concerned, they are identical between free and paid accounts. The service has a strict no logging policy -- including VPN usage, connection logs, IP addresses -- and session data is discarded three minutes after termination of the session. The service supports P2P traffic, offers ad-blocking functionality built-in to its clients, and a firewall on top of that. The free version does not offer OpenVPN configurations on the other hand. 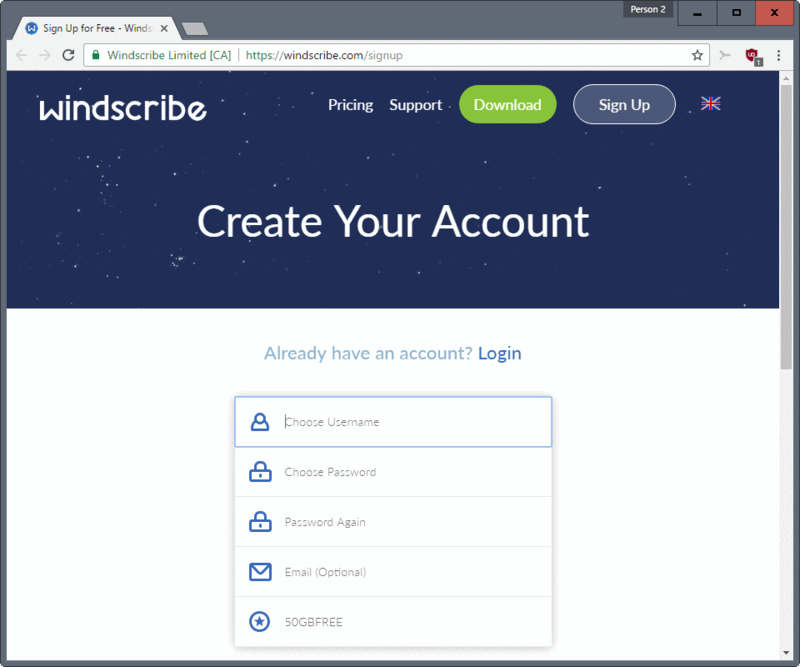 Windscribe offers clients for Windows and Mac (also Linux for paying customers), for the Google Chrome, Firefox and Opera browsers, an iOS app (Android only for Pro customers), and configuration tutorials for routers. Update: The voucher is no longer valid. You may use Expand20 instead to increase the monthly limit to 20 Gigabytes. Click on the "sign up" link in the top right corner of the page. Fill out your desired username and password. Email is optional, but you will only get 2GB per month if you don't add one. Click on "have a voucher" on the sign up page. The new account has five times the regular bandwidth limit of 10 Gigabytes per month now if things worked well. Next step is to download one of the available clients to start using the service, or configure your router if it supports it. Windscribe's offer is excellent, especially with the bump to 50 Gigabytes of traffic. That should be sufficient for all but the most demanding web applications such as video streaming or heavy P2P usage. Since it is free, it is excellent as a backup VPN even if you use a VPN service already. Now You: Do you use a VPN service? If so which, and why? It’s a good VPN in my opinion. Software is ok but I’d love to have OpenVPN profiles, which they don’t offer ATM. oh, I use Windscribe. EDIT: They do offer Openvpn config files but only for PRO accounts. I have used Windscribe for quite a while – it is an excellent VPN, and is highly rated. Grab the offer while you can. What’s this vpn benefit over opera vpn? I’ve been using the later (sg server) and seems fine with it. Opera VPN only VPN-izes your Opera browser traffic, while this one (and all others) take care of all the internet traffic of your PC (updates, e-mails, torrents, Skype, etc, etc). Anyway, “The Linux client and Android client is only available for paying customers.” sadly this one is not for me. I’ve encountered several sites where Opera’s VPN is blocked. They don’t have enough servers to guarantee access. I use Tunnelbear as a backup for now. Windscribe looks good. I’m new to VPN use; I’ve only tried the free Opera VPN so far. If I research VPNs at https://thatoneprivacysite.net/simple-vpn-comparison-chart/ I see WindScribe looks very good except for the last column “Business Ethics” marked in red. Does anyone knowledgeable have a comment on the fairness of this rating? Speeds are good. I suppose one could play with the config file found in the folders and log in with OpenVPN client instead. Not much point . . . good surfing tool. Maybe a foolish question: 50GB of both download and upload traffic? I don’t know, but probably accumulated. They don’t currently have an Android client, so I can’t take advantage of this on my device with the free account at the moment. However, they are planning on releasing an Android client some time this year. Well, it doesn’t work. Without E-mail I will only get 2GB despite of the voucher and I will not be able to reset my password. What is going wrong there? VPN with no DNS and IPv6 leak. …that website explains its rating system– but it is subjective (personal opinion by rater). “Red = “Something major of concern”. 50GB for the first month and then it return to 10 GB or the account will be always renewed by 50GB every month for free? It resets back to 50GB each month. I read a few posts and comments of the founder/owner on Reddit and the guy sounded honest and knowledgeable. But that first impression alone can’t tell if the product is good or not. Definitely worth testing though and the permanent upgrade to 50GB traffic/month is a sweet deal. The one thing I’m curious about is the “firewall” feature in the desktop client, compared to the so-called “killswitch” in other VPN clients. I know what is advertised about it, but I’m curious how it’s implemented from a technical point of view. Does the feature use the Windows Firewall and add rules about it, much like you yourself can and should do when using the OpenVPN client to limit the scope of an application to the VPN-related IP addresses? Installed the browser extension for Firefox and is taking quite a lot more of cpu… Anyone else having that issue? The site only provides 2GB per month if no email is given. True, but if you want more data then you have to sign up and register which is something you have to do with all things on the internet if you want to register to a plan or buy something. It’s something that has to be done. If you don’t want to give your email then you’ll only get the amount. Fair in my opinion. “Email is optional” with only 2GB per month if not provided is “a bit” suspicious …hmm… softly speaking. That’s actually bad! In addition check the speed. Even with “Best location” which is the closest one I’m experiencing at least 3 and > times speed drop… So for me it’s simply unusable. With free ZenMate (Chrome or FFox extensions as an example) there is practically the same speed no matter what server (country) used. No problem with bandwidth yet. I’m NOT promoting it by any means! Anyway “business ethics”, “not logging” and other “privacy issues” paranoia…. Do anybody out there really believe in it? Seriously?! For some reason after installing in Firefox Portable (which I keep open), the cpu and ram keeps on increasing after I have to manually terminate it. At first I thought it was something else, but after much testing I realized it was the extension causing it, but after deleting it the issue persisted, deleting the “App” folder and reinstalling FirefoxPortable again finally solved the performance issues. Just hope it is a bug that can be improved as I quite like the user interface and functionality of the Windscribe Firefox extension. Do note: I haven’t tried the windows installer. Thx so much. 50 GIG and it’s free. Loaded onto my WIN 8.1 machine, runs like a champ. so it’s getting a bit dated. I’m sure that with the recent legislation in America and Australia (and maybe other places for all I know), many people are searching for a more private internet experience. I just hope there will eventually be a worldwide backlash against politicians who instigate spying on citizens via the internet and in public places. Even off the net people are subject to “spying” by government. A local government public library in Australia has installed facial recognition software for their security cameras. If someone borrows a book, the time and date are logged along with their name. Images from the cameras can easily be time matched and bingo, next time the person visits, even if they don’t borrow, the local government knows of this visit. Likewise, the government has “security” cameras in public street and other area. They can easily identify people by accessing the library information. They may also have a similar system in council building, so if a person visits to make a rates payment, their image goes into the database. And don’t forget, you are not anonymous when driving down a highway or around town. Speed cameras, traffic light cameras and cameras at ATM’s and on buildings can see you pass by. Satisfied customer here. For such a new VPN the results so far have been outstanding. A lot of VPN’s need time to improve various features, but in my opinion, Windscribe seriously did their work before they launched it. I haven’t had any issues with it since I first signed up for the pro plan. I wanted unlimited data and to be able to use it on both my android and iOS devices. If you’ve had previous problems, I’d recommend you check out their website as they have a page I follow that provides you with their update info. A lot os previous issue has been solved with their recent changes. 50GBFREE is no longer a valid code. It works perfectly for me and has been very reliable, especially it’s connection speeds. A really easy to use VPN that provides fantastic features and services. A must have! Windscribe is great! There are so many positive reviews circling the net which is great because more people need to know how important it is to use a VPN and how good Windscribe is. Whether you’re on the free plan or pro plan, you’ll still get a high quality overall performance. Easy to use, fast connections, great unlimited data, and a bunch of features that not all VPN’s provide. I especially enjoy being able to visit geo0restricted sites that you wouldn’t normally be granted access to, a big plus. Simple and easy way to safely use the internet + a whole lot of extra features what are all working! I’ve noticed various VPN servers offer services that don’t end up working!! This is very frustrating when you’ve paid for the service but don’t get the quality. With Windscribe I’ve had no issues since first signing up and have always been impressed with the overall performance and speeds. Its an amazing VPN. Lots of positive comments that I find are true and relatable, plus an overal great service with some really useful features. You can also ‘mine for data’. Entirely optional but you can leave a browser open on a pc or a smartphone and let it use spare your cpu power. You can put it toward getting your b/w reset, permanently upgrading your free account by 10gb/month, or buying a pro account for one month. So far I’ve just upgraded my free 50gb to an 80gb one and generally just use it for kodi, etc. Hey Ghackers! Happy customer of Windscribe here, I’ve actually used it for over a year now and recently upgraded to pro due to the unlimited data feature. It’s a great VPN and work well on my mobile as it does my laptop. I tried a couple other VPNs over the last year and none were as good as Windscribe. They are a little bit more expensive but worth the extra $$ in my opinion. Worth every cent! Good selection of features, great speeds, and very helpful customer service staff. My inquiries were seen to straight away. Enjoying the updates as they definitely help maintain the speeds and features, which includes a great selection of security aid. Voucher Code no longer valid. This article is moot. Expand20 is not working anymore? Perfect for everyday use! Been using Windscribe for a couple of months now and it’s provided me with everything I expected and more. It also has good speeds that are consistent even when streaming. I’m very happy with their services and would recommend everyone tries windscribe out even if it’s just on the free plan, as that alone if to class! Windscribe is a great free vpn and even better when on the pro plan. They have so many amazing features, all that are reliable, and the speeds are also top of the line. I’ve had no problem watching movies, downloading, and uploading with Windscribe and definitely feel this a vpn above many others.